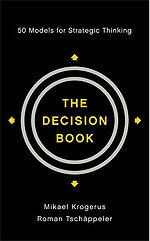 The book contains fifty of the best decision-making models ever developed. In minutes you can remind yourself of or become conversant with almost all decision models available. Wheter you need to plan a presentation, assess someone's business idea, or get to know yourself better, this guide - bursting with helpful visual tools - will help you simplify any problem and make the best decision.